Once you settle on a career path and specific job, how do you best market yourself so that you separate yourself from your competition? Of all the technical, business and social experiences you have acquired, which are the ones that will resonate with hiring managers and make you stand out? Learn how to find this information within job ads, and through your network. Learn how to research a job, the company and its people so that you can best market yourself in the context of what’s important to them to give you the maximum competitive advantage. Most scientists only focus on “Can I do the science?”. Essential as that is, that’s only step 1. 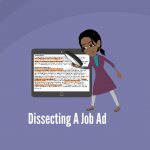 The first two videos will show how to dissect a job ad and find the critical skills beyond the science that industry values and that will separate you from your competition. 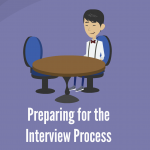 The remaining videos will show you how to research companies, their products and the people in order to best prepare for the interview experience. Your goal is to demonstrate that you are business-ready for this specific job, and know how you will positively impact the organization. Dissecting a Job Ad – Hiring managers or recruiters often take less than 10 seconds to scan a resume. This may be the screening that determines whether you are even considered for the job that you want. So what can you do to emphasize the skills that the company is looking for in a way that is likely to get noticed, even in that first pass? In this 14 minute video, we will show you how to dissect a job ad and map the content into our 24 core competencies in six major areas, and how to use that information in order to craft a targeted resume that focuses on what the company believes is important. This process will also give you talking points about your own experiences with accomplishments that will help you through the interviewing and hiring process. 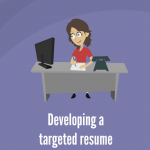 Developing a Targeted Resume – The job market for today’s scientists is extremely competitive, and so you have to do everything you can to stand out against your competition. Your resume is the first official introduction of you to the hiring manager and it stands between you and landing an interview. It needs to be focused, targeted, easy to read and clearly advertise the best and most relevant skills and accomplishments that you offer and that they value. Learn how to develop a targeted resume that emphasizes your scientific, business and social skills that are relevant for the job you want. 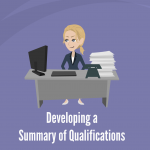 Developing a Summary of Qualifications – The point of developing a targeted resume is to clearly indicate why you are qualified for the job, and to convince the reviewer to grant you an interview to learn more. The Summary of Qualifications builds on the techniques of dissecting a job ad to compose a very focused 5-7 sentence statement that clearly indicates your scientific, business, and social skills that are RELEVANT FOR THAT JOB and to set expectations. Professional organizations hire people, not scientists. Show them you are not just a technical expert, but rather, a person who can apply your technical expertise in an integrated team environment. Preparing For The Interview Process – Getting notified that a company wants to interview you for a job is exciting. It also signals the next step in landing your job, which is how to best prepare for that interview process. Your value to the company goes way beyond your technical skills, and the job interview is designed to evaluate whether you have all the skills and experiences they look for in the successful candidate. In this video we will look at how you can best prepare for the interview experience so that you demonstrate your entire brand and value. 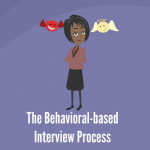 The Behavioral-Based Interview Process – Most large organizations utilize the behavioral based interview process for objective evaluation of candidates. Learn the types of questions they ask, understand the process and learn how to format your responses to make you a more competitive candidate. You have to assume that your competitors can do the science. What are the business and social skills you bring that make you the clear choice? How can you convey that effectively during the interview experience? What Are You Worth – Your Total Compensation – If you ask the question, “What’s my salary?” you are broadcasting to the nonacademic world that you don’t have a clue about compensation in the world of business. Every job has a value range and that’s what you are worth to a business (unless you are an owner). We cover the common ways you earn money (about 12), how Human Resources sets a base salary and how to research compensation for a job/company and determine your worth. 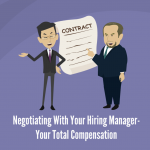 Your initial job title and compensation set your base for the future – so get your full value!! Other than our videos, here are some resources you can use to gain more information regarding this topic. We will be adding more over time, so make sure to come back to this page. If you find some interesting resource and would like us to consider to post it here, send us a message by clicking here. These SciPhD documents become available with the purchase of the videos.